USA/Netherlands, October 23, 2017 – Today, Lighting Global, the World Bank Group’s platform to support sustainable growth of the off-grid solar market, and GOGLA, the industry association representing the off-grid solar sector, launched the latest Global Off-Grid Solar Semi-Annual Market Report, which includes performance data from 65 companies and covers the period of January to June 2017. 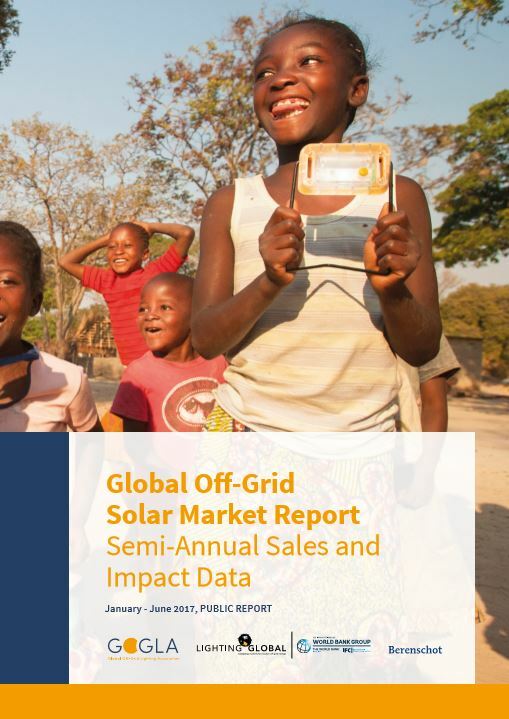 Overall, there was a 7% drop in worldwide sales volumes of off-grid solar products since the last six-month update, which covered July to December 2016. Nevertheless, there remains a buoyant market in which companies are taking an optimistic approach. At the same time, according to the International Energy Agency, the sector needs to grow significantly in order to meet universal energy access targets by 2030—on the order of an additional 195 million people. To realize this goal, critical barriers to growth need to be addressed. “Today’s report shows that companies working in the off-grid lighting and electrification sector operate in difficult and often unpredictable market conditions,” explained Koen Peters, Executive Director of GOGLA. The report identifies several market drivers that have played a significant role in influencing the results of this reporting period. They include the East African drought, the continued effects of demonetization in India, and increasing commodification in smaller product categories. Despite these external factors, companies are continuing to expand into new markets, and are innovating with new kinds of government partnerships that are enabling even further market penetration. 3.52 million product sales were reported in the first half of 2017. Sub-Saharan Africa and South Asia account for approximately 1.77 million (50%) and 1.16 million (33%) of the total reported sales, respectively, with India remaining the highest volume sales market globally. The combined cash sales revenues in H1 2017 amount to about $95.57 million globally. 30.7 million products have been sold by Lighting Global associates and GOGLA members since 2010. The drought across East Africa has continued to impact the region. While some areas are showing signs of recovery, there are still severe consequences, including food security emergencies in several countries. Demonetization that occurred in India in November 2016 continued to negatively impact sales in the largely cash-based economy. Commodification of the market for entry-level products has increased competition in the sector from copycat and unbranded, unreported product sales. At the same time, we observe increasing brand awareness among consumers for high-quality products. seasonal trends and other environmental factors. $5.2b has been saved in energy-related spending by off-grid households (due to switching from expensive energy sources such as kerosene). Over 120 million people have benefitted from improved energy access due to off-grid solar products. Cumulatively, 28.6 million metric tons of CO2e has been avoided due to a reduction in kerosene use, equal to taking eight coal-fired power plants offline for a year. Following today’s report, the next biennial Global Off-Grid Solar Market Trends flagship report will be published by Lighting Global and GOGLA in early 2018. This in-depth study into the off-grid solar sector worldwide will include detailed research into investment trends, advances in technology, marketing, finance, and policy developments, while also looking at the nuances of the social impact made by the industry—thus building an even deeper understanding of the market. More than 600 key stakeholders including manufacturers, distributors, investors, entrepreneurs, donors and policymakers will explore industry developments across five important areas: business development, access to finance, technology, quality assurance, impact and policy. The event will also be an opportunity for companies to showcase their latest products, services and innovations at the industry’s leading exhibition. View the agenda and click here to register. GOGLA is the voice of the off-grid solar lighting and electrification sector. Established in 2012, GOGLA now represents over 100 members as a neutral, independent, not-for-profit industry association. Its mission is to help its members build sustainable markets, delivering quality, affordable products and services to as many households, businesses and communities as possible across the developing world. The products and solutions that GOGLA members sell transform lives. They improve health and education, create jobs and income opportunities and help consumers save money. To find out more, visit www.gogla.org. Lighting Global is the World Bank Group’s platform to support sustainable growth of the international off-grid solar market as a means of rapidly increasing energy access to the 1.2 billion people without grid electricity. Through Lighting Global, the International Finance Corporation (IFC) and the World Bank work with the Global Off-Grid Lighting Association (GOGLA), manufacturers, distributors, and other development partners to develop the modern off-grid energy market. The Lighting Global program supports market development by working with private companies to lower first-mover risk and mobilize private sector investment through market intelligence, quality assurance, business support services and consumer education. To find out more, visit www.lightingglobal.org.